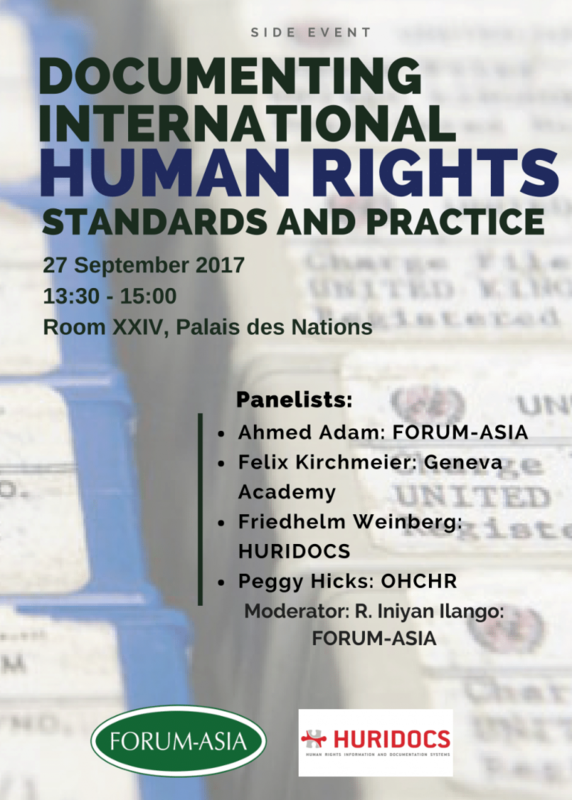 For implementation of international standards to be effective, it is essential that human rights defenders know and understand their rights. The Rights of Defenders project promotes and builds understanding of international standards and provides clear, accessible, and targeted insight into the standards and the context that surrounds them. As part of the project, HRHF has developed tools and resources for defenders to disseminate standards nationally, engage with authorities and hold them accountable to the commitments they make internationally, and initiate national conversations on the importance of defenders and their work. 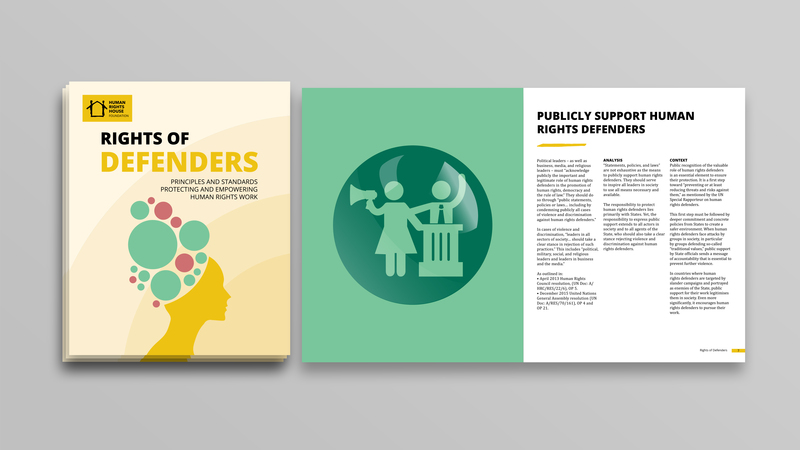 The Rights of Defenders resources – developed by Human Rights Houses and HRHF – promote and build an understanding of international standards and provide clear, accessible, and targeted insight into the standards and the context that surrounds them. The aim is to provide resources to help defenders to disseminate standards nationally, engage with authorities and hold them accountable to the commitments they make internationally, and initiate national conversations on the importance of defenders and their work. These resources are currently available in English, Russian, and Georgian. Human Rights Houses and HRHF are in the process of translating the booklet and other related materials into other languages. These will be published on this page when available. We currently expect translations into Armenian, Croatian, Tatar, and Ukrainian. 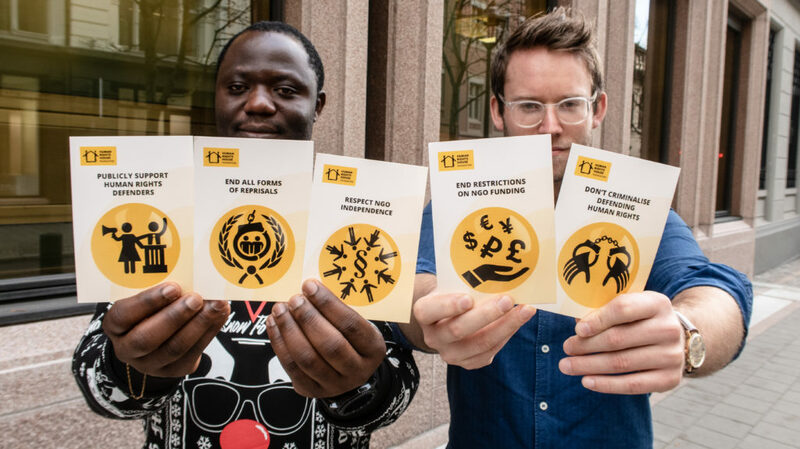 The Rights of Defenders booklet is divided into 16 standards, inspired by the strong content of landmark resolutions on human rights defenders and their work, adopted at the United Nations and Council of Europe. It condenses the main points of each standard as outlined in the resolutions. The standards confer both positive and negative obligations – whether it is action or refraining from an action. They are illustrated in red or green respectively to illustrate these obligations. The booklet also provides analysis to inform the interpretation and implementation of these standards. This is inspired by the commentary of experts such as UN Special Rapporteurs and by the experience of HRHF and Human Rights Houses in Western and Eastern Europe, Balkans, and the Caucasus. Further, to give context, the booklet outlines the trends affecting each standard and provides recommendations for their implementation. Download the Rights of Defenders booklet. References and sources In most cases, defenders may only need the main points of each standard together with analysis and context, as provided in the booklet. Yet there may be other occasions that require more detailed information. Our companion document provides sources and in-depth referencing to the full language of the resolutions. Download the Rights of Defenders companion document of references and sources. 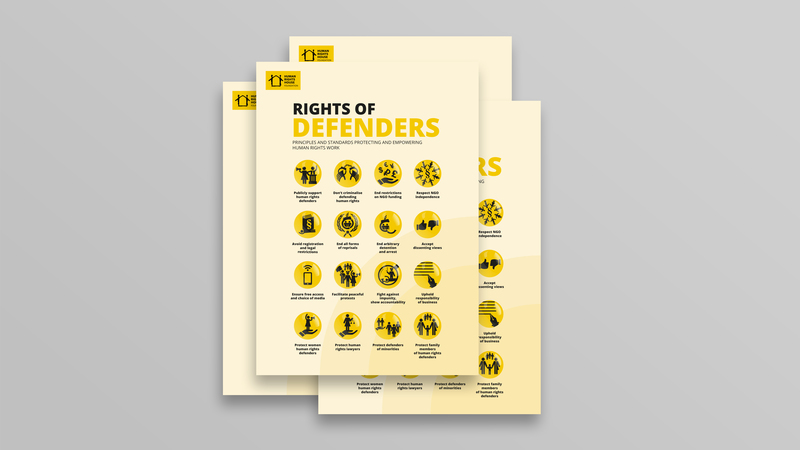 Rights of Defenders Poster: 16 international standards protecting and empowering human rights defenders. The Rights of Defenders poster promotes the 16 international standards outlined in the booklet. It aims to help promote and raise awareness of these standards. 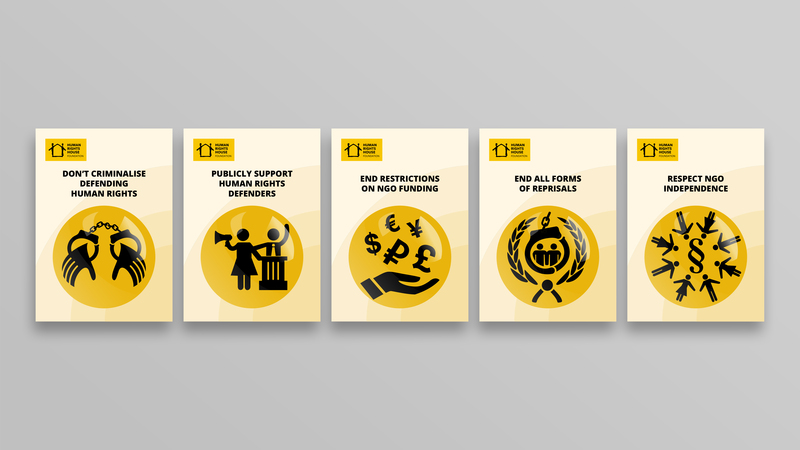 Rights of Defenders Postcards, each highlighting an international standard protecting and empowering human rights defenders. The Rights of Defenders postcards are a tool to promote and raise awareness of the standards that are most relevant to a particularly country or situation. They are designed to be printed A6, but also work at other sizes. Postcards with five of the most prominent standards are available to download below, though on request we can provide postcards for any of the 16 standards featured in the booklet.